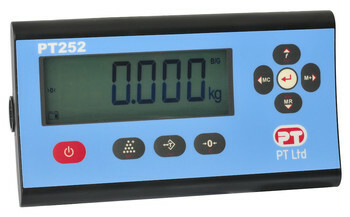 The PT252 is a low cost, high quality general purpose weighing indicator for industry in a plastic housing. Weighing, Counting, Check weighing and Dynamic Weighing for animals are standard as is printing selectable from 5 languages. It has 100 memory locations for Average Part Weight for Counting and 100 product memories for check weighing. The PT252 can also be configured as a remote display for Azure instruments. The PT252 is approved by Weights & Measures Authorities for use in Accuracy Class III applications with 10000 and 2x6000 intervals in accordance with OIML R76. Easy and practical operation via navigation keys with two programmable function keys and 25mm high digits and wide viewing angle, backlit LCD display. The PT252 is powered by an AC power adapter with UK mains plug configuration and internal re-chargeable Li-ion long life battery. Stand and wall mount accessories are supplied as standard.